Endoscopic ultrasound elastography (Fig. 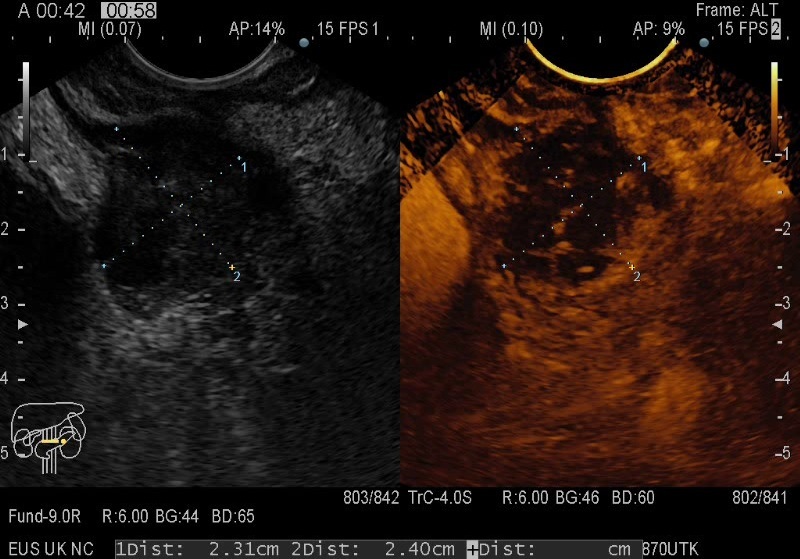 1) + Contrast enhanced harmonic EUS (CE-EUS) (Fig. 2, Movie 1) + EUS-fine needle biopsy (FNB) (Fig. 3). Malignant pancreatic tumors are typically stiff hypoenhanced lesions. For contrast-enhanced EUS, a peripheral rim (visible during microbubble trace imaging mode) with central hypoenhancement in the arterial and venous phase is suggestive of a pancreatic metastasis. In patients with a personal history of a colorectal cancer this indicates the need to use a histological needle biopsy followed by immunohistochemistry (IHC) analysis, performed in order to rule out pancreatic metastasis.